The Olympics have historically been a hotbed for testing new entertainment technology. First came color TV in 1964, 1080p HD in 2008 and 2012 marked the first-ever Games in 3D. This year's Sochi Winter Games are no different. While tech news surrounding the biennial spectacle have been keenly focused on new fangled speed skating suits, bomb detection methods and hackers, Ultra HD is also making an appearance at the global sporting event. Unfortunately, the tech won't be standing on a podium. Over the last couple of months murmurings swirled that electronics companies and TV networks were teaming up to record and show the Sochi Olympics in 4K. After a bit of digging, TechRadar learned that the Olympics would indeed be shot in 4K and even 8K. However, these UHD Olympic takes won't be viewable to the general public save for those visiting NHK-sponsored public viewings in Japan. 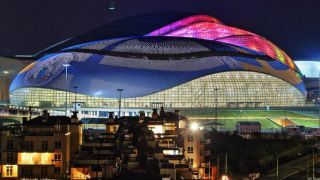 Otherwise, most of the footage will only be shown at special press viewing parties and other private events, making Sochi's 4K a more closed-off affair than the Super Hi-Vision (SHV) cinemas hosted by the BBC for the 2012 London Games. There is some high-def developments worth noting for these Games, and we've gathered what the International Olympic Committee (IOC) and various firms have planned on the UHD front. Perhaps, by the time Rio rolls around, 4K will be ready for prime time. We first caught wind of the beyond-1080p HD plans for the Winter Olympic from an IOC release stating, "Sochi will be the first Winter Games to have individual events broadcast in Super Hi-Vision digital format." In this SHV format, the IOC and Olympic Broadcasting Service (OBS) camera operators will catch the athletes strutting on the ice and flying through the snow in 7680 x 4320 pixel resolution. While this isn't the first time we've seen the Olympics captured at 16 times the quality of traditional HDTV footage (London 2012 took that crown) this will be a first for the Winter Games. The Olympic overseers hope to catch every high-def detail from this year's event, right down to specks of ice coming off the hockey rink. The main Olympic body isn't the only one planning to record beyond 1080p; Panasonic revealed it would also record the Opening Ceremony in 4K. What's more, the Japanese electronics firm revealed the 4K-capable GH4 on February 7, a fitting announcement to show non-professional shooters that Ultra HD video is within reach. One of the biggest problems with bringing 4K to the masses is the lack of content and cameras' notoriously high price tags. For example, the UHD-capable Canon EOS-1D C cost upwards of $12,000 (about £7,351/AUS $13,438). Panasonic's GH4 should come in at a more consumer-friendly price, though that information is still missing. Between the professional cameras and consumers bringing their own devices to the Games, 4K-plus is making an appearance in Sochi. Why then are those sitting at home hoping to catch the action in Ultra Hi-Def left with lower resolutions? The answer is obvious to those who've followed 4K's plight; the infrastructure, equipment and consumer-owned UHD TV sets simply aren't there to make these shots widely available to the watching world. While the IOC boasted that it will be able to show the Olympics in a nearly life-like detail and utilize 22.2 multichannel surround sound, it didn't share specifics on where the 4K films would end up. We asked the OBS where the broadcasts are headed, but haven't received word if any of them will air directly to customers. While 4K may not be making its way to households, many of the sporting events shot in UHD will be shown at invite-only viewing events. A spokesperson for cable company Comcast told us that in general, it has the means to deliver 4K content to customers, but programmers and studios have yet to that content available.